Mayuko & COQOOC is taken up on some French information sites. Please check them!! Mayuko is taken up on some French information sites. Please check them!! Please check new mayuko's music video. This song “光の海 (Hikari no Umi)” is the first track from mini album "muguet feerique”. Mayuko is taken up on English information site.Please check it out!! Mayuko is taken up on some Itarian information sites.Please check them!! You can download music of mayuko's new album"muguet feerique"
from the iTunes Store and others, after March 30, 2016. *released in 30 music data distribution sites. *For more information, click "Discography page". You can sing songs of mayuko at KARAOKE "JOY SOUND". You can listen to Mayuko's show on "Nihon no OTO"(French radio). 11 Dec 2015 Friday- 9pm~ (French time). You can listen to Mayuko's show on "face" by JFN. 17 Dec 2015 14:30~ in Japan. Mayuko on TV program by NOLIFE from 21th November. You can listen to Mayuko's show on "Umano mimi ni Headphone" by Rainbow FM. 21 Nov 2015 1:00pm in Japan. This is the ending theme song for a TV program "Europe ichiban Ryokouki" BS TV ASAHI. "Europe ichiban Ryokouki" means "My best diary on a journey in Europe". This music video is a private movie of Mayuko taking a trip to Europe. "Benjamin" is included in mini album "muguet feerique" released on 15th November 2015. Mayuko is taken up on French information site「Van Music」.Please check it out!! Mayuko is taken up on French information site「Zero Yen Media」.Please check it out!! "Mayucocoon Shop ~All over the world~"on this official web site. You can buy Mayuko's items here. A new song "BENJAMIN" 's music video is on the air　everywhere in Japan. ●Roppongi Hills Arena TV Asahi's electronic billboard. from 15th October 2015 to 15th November 2015. ●the TV program "TOKUMORI" by TV Asahi group "Aomori Asahi Housou"
New song"Benjamin" is on air by cable broadcasting system "USEN". Mayuko is taken up on French information site「LA Folie des Mangas」.Please check it out!! Mayuko on TV program "J-MELO" by NHK WORLD. 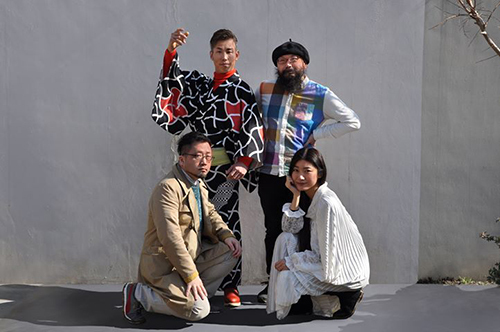 J-MELO(NHK WORLD) is showcasing new Japanese acts who want to make it big on the global stage. They've each started getting attention since the beginning of 2013. You can give them a boost. So check out their videos, then vote for your favorite acts and tell us why you like them! You can vote from July 3 to September 30. Hello! !please lend me your strength!! Mayuko's number is "33" !! Mayuko's song “Benjamin” is the theme song for TV program "Europe ichiban ryokouki" by BS TV Asahi. Mayuko is taken up on French information site「J-Pop Idols」.Please check it out!! Mayuko is taken up on French information site「zero-yen-media」.Please check it out!! Mayuko is greatly taken up on the TOP page of Sync Music Japan. Please check it out!! Mayuko appears on NOLIFE TV during mayuko's stay in France on March 2015. Mayuko on Youtube Channel of "Nerd Stalker". Please check out a great interview with Mayuko. UKのpodcast番組 "It Came From Japan"
Mayuko appears on the UK podcast. Mayuko is taken up on some Italian information sites. Please check it out!! Mayuko on PROMIC.TV! Please Check it out!! "J-POP NEWS vol.77"
"a child in the cocoon "'s booth number is「M-24」. Mayuko on "For Music TV" in Italy. "Otaku TV Italia" of the For Music TV channel. Mayuko's music video is broadcasted in Piedmont, Liguria, Lombardy. Mayuko is taken up on Italian information site「Ochacaffe」.Please check it out!! Mayuko is taken up on English information site「Diverse Japan」. You can listen to Mayuko's show on "Turquoise Radio". 22 Aug 2014 Friday- 6pm Pacific, 9pm Eastern in the US. 23 Aug 2014 Saturday-10am in Japan. Mayuko is taken up on French information site "La Folie Des Mangas". Mayuko is greatly taken up on the TOP page of Sync Music Japan. New Music Video "Cho to Ami (Butterfly & Web)" is released. "a child in the cocoon ~mayuko~"'s booth number is "BL41"(HALL ５A). Mayuko is taken up on it. Mayuko First Full Album "Vista Bouquet"
released on 13th April 2014!! ※please look at Discography page. Mayuko Music Video "sennen matsuri"
This is the collaboration works by three artists. you can watch NOLIFE TV or YOUTUBE. In addition, Mayuko is also introduced in the workshop of Midemu. 15:00 to 17:00 on February 2 local time, state of the workshop will be relayed by Ustream. By all means, please see. Check out a great interview with Mayuko on PROMIC.TV. "a child in the cocoon "'s booth number is「M-38」. copyright (C) cocoon project All Rights reserved.